When looking for accommodation in Glencoe I was often spoilt for choice with many cottage and hotels in the area there was always somewhere excellent to stay, I often like to stay in accommodation that gives you a real sense of been within the local area, and in my case right bang in the center of Glencoe. I have stayed in the area many times before usually outside of Glencoe in Fort William, Onich and Ballachulish, on this occasion I wanted to be within the mountains and in reach of local amenities without relying on the car, Getting this correct balance is vital if you want to enjoy a walking holiday and with a little help from Google I discovered Glencoe Independent Hostel. The Glencoe Independent Hostel is perfectly located just off the A82 road that takes you through the stunning pass of Glencoe, and for me one of the best drives in the country. The hostel lies between the Clachaig Inn and Glencoe Village, both within easy walking distance, so if you require a pint of milk or a nice cold pint of beer you can’t possibly go wrong. If you prefer to stay in the self catering accommodation, the caravans offer a very clean and modern place to stay, with comfortable furnishings, digital TV and all the conveniences to enjoy a self catering holiday in Scotland. The bedrooms consist of a double room and two single beds in another, there is also an option of a double bed in the lounge area altogether sleeping up to 6 people. There is a large gas fire in the lounge for those colder nights and we found this more than adequate, all the towels and bed linen are included in the price, also included in the price is the gas and electricity. On top of all this you are presented with one of the best views I have seen from a caravans window. 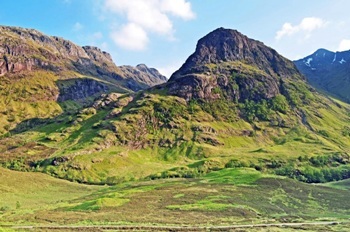 Glencoe is well known for its history and its magnificent mountains and I found Glencoe Independent Hostel the perfect holiday base to allow me to enjoy all of these. Walking is very popular in the area and the hostel offers guided walks around Glencoe or a trek up one of the Glens popular mountains, the guides are all fully qualified and experts in the local area. So if you want to experience an adventure to the top of a Munro or just want to explore the local area this can all be organised from the hostel. Bike hire is also available locally in the village and the staff at the hostel will happily point you in the right direction. There are plenty of places to enjoy a nice meal or snack locally, with the closest being the Clachaig Inn a short walk away, and the Glencoe Cafe in the village. Also within easy reach is the Glencoe Hotel and a nice cafe adjacent to Craft and Things located on the A82 towards Ballachulish. A short ride away you also have the Loch Leven Hotel and the Holly Tree Hotel, and of course you have Fort William not too far away with an abundance of places to eat and shop. We have included a small map below to help you find these places. Overall we found the Glencoe Independent Hostel a real gem of a place to stay and very affordable as well. The hostel is owned by Keith and Davina Melton, who with their family live on site and love the outdoors. They are always there for you if you need any information or help and offer a great place to stay with a warm welcome. I recommend this hostel to anyone either looking for Hostel facilities or self catering options at a very good price.